Basketball is a team game played by two teams of five players each with the objective being to score by throwing the ball through a netted loop located at each end of the basketball court. Basketball was invented by a Canadian named James Naismith in 1891 during his teaching days at the YMCA in Springfield, Massachusetts. The game has spread across the world becoming one of the most popular sports around the globe. 1923 saw the formation of the Canadian Amateur Basketball Association (CABA) which was entrusted with the responsibility of governing all basketball activities in Canada. In 1973 CABA voted to adopt the international basketball playing rules which were formulated by the Federation Internationale de Basketball Amateur/International Amateur Basketball Federation (FIBA). CABA later renamed to Basketball Canada in 1980. According to a report released by the Canadian Youth Sports, almost 500,000 youth aged between 3-17 years are engaging in basketball activities in Canada. There has been a wide acceptance that basketball is an under rated hobby that improves cardio, strength and making new friends which has helped increase the popularity of the sport in Canada and other regions across the world. Students in Canada are allowed to participate in the college and varsity basketball league around the country. The varsity games are governed by U-sport while the Canadian Colleges Athletic Association is the national governing body for college sports. There are also several youth players both men and women who take part in the United States’ National Collegiate Athletic Association. 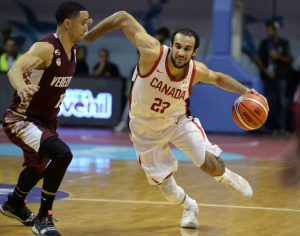 The Canadian Elite Basketball League (CEBL) which will be operated by the Canadian Basketball Ventures is a professional basketball league expected to premiere in the spring of 2019. By May 2018 six teams had already been drafted to participate in the spring event. The teams include Edmonton Stingers, Saskatchewan Rattlers, Fraser Valley Bandits, Niagara River Lions, Guelph Nighthawks and the Hamilton Honey Badgers. The league’s main focus is the development of Canadian basketball talent while at the same time attracting top professional players from across the globe. With only the Toronto Raptors representing Canada in the NBA league, other basketball teams from Canada participate in other domestic minor leagues. The following are some of the popular basketball leagues in Canada. The NBL was founded in 2011 with three former Premier Basketball League teams joining four other franchises to form the “original” seven NBL teams. By 2017 the number of participating teams had increased to ten with four teams based in Ontario and the other six teams based in the Atlantic province. The league runs from September to April of the following year with the top four teams qualifying for the playoffs. The American Basketball Association (ABA) is a semi-professional American amateur league that is played by teams from both Canada and the United States that was founded in 1999. The current ABA has no relationship with the American Basketball league which was considered a major basketball league in America but later merged with the National Basketball Association in 1976. The teams that participate in this league are generally from large populous cities to attract more fans and the league is divided into regions so as to minimize the travel costs for participating teams.